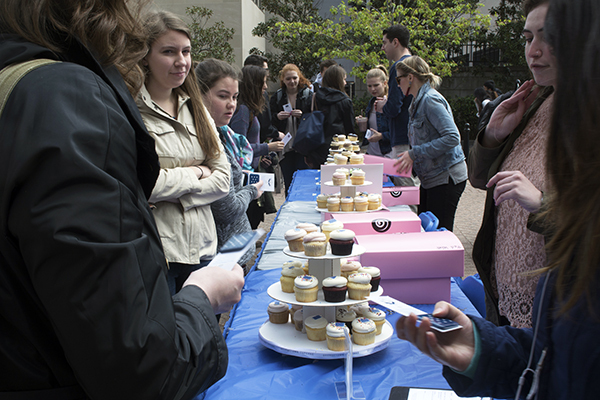 Students pick up cupcakes in Kogan Plaza in exchange for writing a thank-you note to a donor. Updated: April 15, 2016 at 3:49 p.m.
Officials focused their efforts on getting 12,000 alumni donations in the days leading up to the event to unlock a $100,000 gift. And while students were still encouraged to give to the University, substantially more alumni made donations for the event compared to last year. More than 12,000 alumni have now given gifts since the start of the fiscal year on July 1, 2015, meaning Elliott School of International Affairs alumnus Michael Hope will donate $100,000 to GW’s Power and Promise Fund, which provides need- and merit-based scholarships for students. And more than 500 students made donations as part of Flag Day – in return, a group of parents will give $12,000 to the Division of Student Affairs. This year, GW raised about $72,000 more overall than had been raised during last year’s event. Last year, the University raised about $40,000 from more than 600 students and 200 alumni. University spokesman Brett Zongker said the University was “pleased” that Hope stepped forward to motivate other alumni to donate, which wasn’t the main focus of last year’s event. “Our 2015 Flag Day alumni fundraising was smaller in scope – focusing on one day of giving – and was more discrete in terms of how we counted alumni donors. That said, it is not a relevant comparison to make with 2016,” he said. Zongker added that 1,300 new alumni donors gave during the past few weeks. This year’s events were only held over the course of one day instead of two days like last year’s blitz. This year, students wrote thank you notes to donors in exchange for cupcakes in Kogan Plaza and were able to print pictures in the Marvin Center. Flag Day “awareness centers” were also placed in different buildings across campus, including the lobby of the Elliott School of International Affairs. 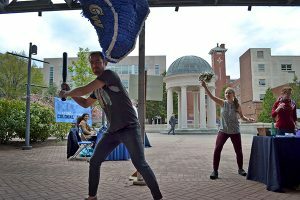 Max Waszak, a graduate student in the classical acting program, hits a piñata during Flag Day festivities as fellow graduate student Julia Proctor cheers him on. Students were also given control of GW’s Snapchat account, sending out pictures and messages from across campus about the event. Students were also featured if they had received donor-funded scholarships. Aristide Collins, the vice president for development and alumni relations, said Hope’s gift allowed GW to build up momentum over the past several weeks in anticipation of the event. GW has raised about $835 million so far toward its $1 billion campaign. Other programs, like the Senior Class Gift Campaign, target current students every year. Experts and officials hope if students make it a habit of donating before they graduate, the pattern will continue. Jeremy Gosbee, the president of the GW Alumni Association, said he’s glad that GW is continuing the event and helping to instill a sense of giving for students. Jeremy Gosbee is the president of the GW Alumni Association. The University’s fundraising efforts during Flag Day this year focused more heavily on alumni gifts than last year’s push.